Gateway Online exists to shape leaders who expand God’s kingdom around the world by making theological education available to students anywhere in the world. Gateway Online’s fully accredited master’s degree programs combine the best of academic studies with significant ministry training to prepare men and women for a variety of ministries. The Diploma in Theology and the Diploma in Educational Leadership are available online, as well as at all Gateway Seminary campuses. If you are not yet sure you want to commit to a degree or diploma, a certificate offers a quicker option that will directly impact your ministry. Units are transferable to degree programs and a certificate can be completed with only fifteen credit hours. The online course schedule is subject to change. Depending on enrollment, course sections may be added or removed to meet the demand of the students' needs. Our online professors tailor their online curriculum specifically for you, the online student. With the support of the online office, our faculty implement the best practices of online education to give you a high-quality online learning experience. 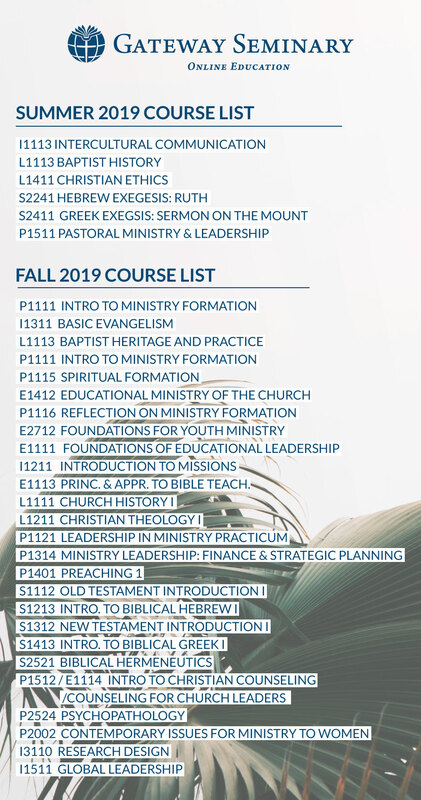 We plan assignments and activities that can impact your ministry today while building a theological foundation for your future. You will be able to implement new tools directly where you serve while receiving constructive feedback from your professor and classmates along the way. Our faculty know that online education works best when the students are connected to each other and to the professor. We intentionally build online courses so that students can form meaningful relationships with each other and their professors. Our learning management system, Canvas, is user-friendly and simple. Whether you are using Canvas on your desktop, laptop, or mobile device you will have access to Canvas technical support 24/7. The Gateway Seminary Library houses thousands of resources online and available to you from a distance. Not only will our librarians send books directly to your home or office, they are also embedded in courses with major writing assignments. They will provide you with help in locating resources, using the library search tools and formatting your paper.